Basically, in December, I used 7.7Gb of data, rather than the fair use amount of 3Gb. 1) A look at my data usage over the previous 17 months of the contract would have shown the high usage to be anomally (due to moving house) rather than the norm, and as I regularly have a £100 of my monthly call and text allowance left over you’d think they would be a bit more leniant. 2) If I had continued to use data at the December rate, then telling me on January 22nd would have been too late to prevent me going over their limit in January; thus forcing me to be reduced to 64Kbps. 3) My 18 month phone contract ends this week. 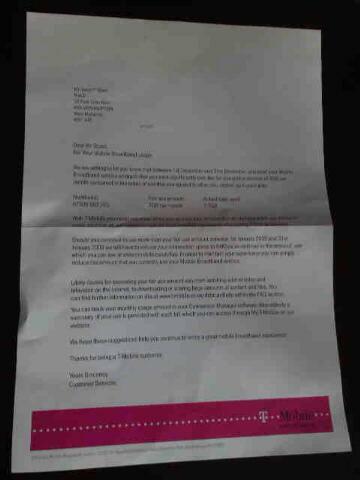 This letter doesn’t persuade me to sign-up with T-mobile for another contract.